Posted on July 15, 2014	by Denise Banks-Grasedyck, Coach. Consultant. Speaker. Whew! No black eye, no bruised cheek, no bloody lip. No physical evidence of the abuse, abuse I have subjected myself to over the last couple of weeks, all because I took off my CAP. My Compassion. Acceptance and Presence for and with myself. Sure, I still remembered to wear it with others, but I forgot about myself. I got busy and did not hold the space to cut myself some slack for being human, for having concerns and needs, and for experiencing emotions that interfere with my efficiency in getting things done to my own standards. Yes, we all go through this occasionally. The clue is not to stay there too long. Fortunately, I check in with myself regularly and simply ask “How alive, connected and supported do I feel?” if the answer on a 10 point scale is less than eight, I know it is time to adjust my CAP or in this case, figure out where I had last seen it. The Dalai Lama once said, “COMPASSION is not religious business, it is human business, it is not luxury, it is essential for our own peace and mental stability, it is essential for human survival.” I totally agree. And Forbes magazine recently offered a great article on COMPASSION and the bottom line in business. A good read. You will find the link at the bottom of this post. Compassion is a universal good; we need it all the time as we walk through life. Everyone we encounter needs it and we need it for ourselves. As often as it is denied, the same is true for ACCEPTANCE for others and first for ourselves. 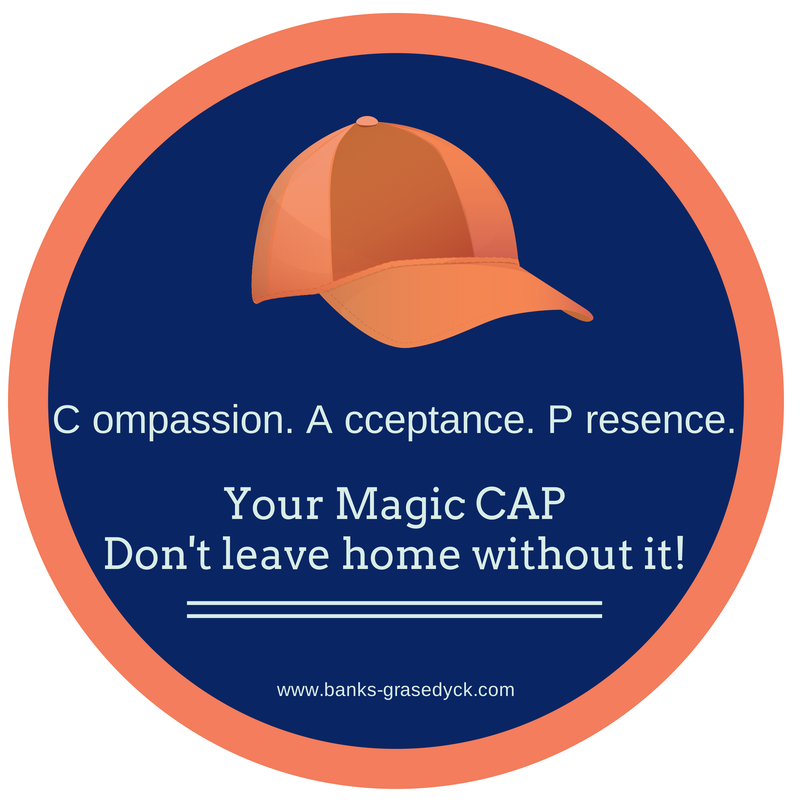 So what is the role of PRESENCE in the magic CAP? Simple, you cannot offer compassion and acceptance if you are not present. The desire to be “somewhere” other than the space, the moment, than we are currently in, causes discord and distress in and around us. We practice various forms of absence; multi-tasking, overcommitting, busy-work and worrying are common ways in which we try to escape the present rather than be with our discomfort. In case you are wondering, this is as helpful and effective (and often as painful) as using a really hot towel on a sunburn, so why expend the energy? Compassion. Acceptance. Presence. In life. In business. At home. At work. Everywhere. All the time. Good for you. Good for the world. Put on your CAP and carry on making the world a wonderful place because YOU are in it! Know someone who never cuts themselves a little slack? Why not share this article with them! This entry was posted in Burnout Prevention, Insights, Success Tips. Bookmark the permalink. Yup, I know plenty of people who don’t cut themselves any slack. But, like me, they’re learning how to do that. Love and compassion will win the day every time. Love this!! Great reminder and very timely too, Denise. I’m in the think of doing my own work of having lost my CAP somewhere in the last 2 decades. The price has been high, not going to kid you. I’m creating a new cap of authentic colors and magical tapestry that I remind myself to wear daily, starting with breathing and affirmations upon waking and the same as I drift to sleep. Love the acronym, I’ll be using that! Aly, thanks for sharing that. I Love your imagery of a “magical tapestry” and it sounds like you are Setting a great foundation to create an enduring CAP. Denise this is great! I love that you ask yourself “How alive, connected and supported do I feel?” That sounds very powerful. Even for those who are pretty good at practicing CAP, it can be difficult to give ourselves that room to be human. I’m with you girl. Striving and learning every day. Being present and mindful is something that so few of us do. We always seem to think we need to be multi-tasking and often thinking of past and future versus being totally present in what we do. I do practice trying to really focus on the one thing I am doing and quieting my mind with focusing on what I am doing does help my level of peace. I love your acrynom CAP!